Climate change is a topic that interests many activist photographers and Mathias Braschler and Monika Fischer, his wife and photographer partner, are no exception. 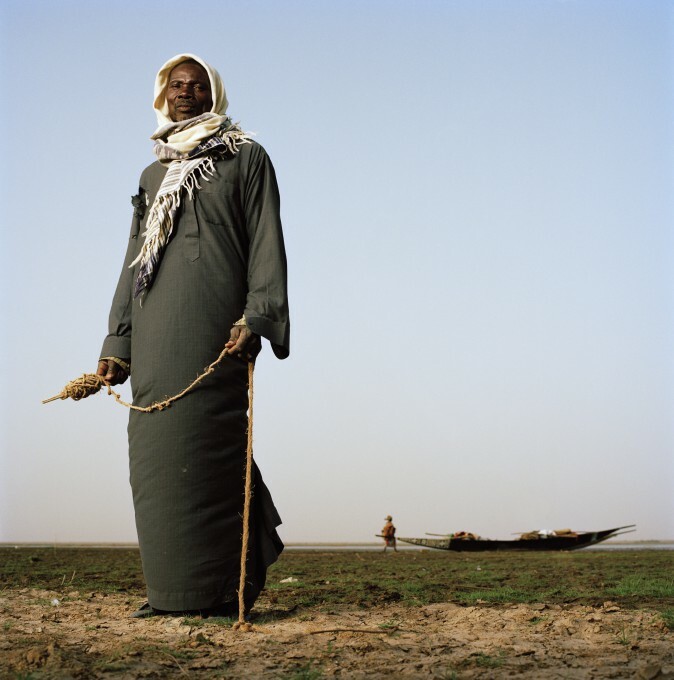 They have created a compelling photographic record of the current environmental problems caused by the general lack of governmental action on climate change. What sets them apart is their approach: They are portrait photographers, and their resulting project and book, The Human Face of Climate Change, is well, just that: the human face. Yang Gengbao (69) and his wife Huang Lianfeng (68), shop owners in Hongse, Guangxi, China lost their property to floods, which have become more frequent because of the intense storms caused by climate change. “We wanted to focus on how regular people are affected, so we searched for locations where climate change was already a factor,” says Braschler, who started his photographic career in 1994 as an editorial and commercial photographer. The team found acceptable locations in 16 countries on all continents except Antarctica. 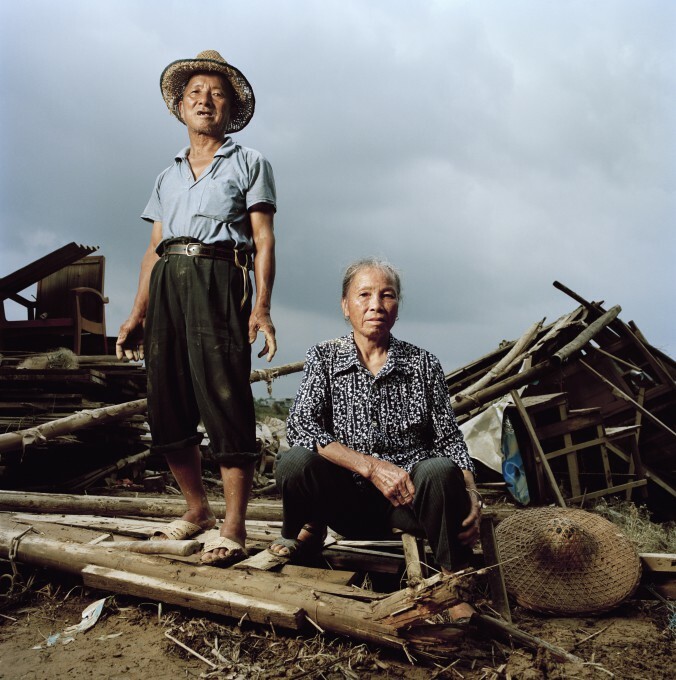 They photographed real people whose livelihoods or lives were already impacted by the changing climate. Avetik Oganisovitch Nazaryan, Ludmila Nikolaevna Nazaryan and their daughter Liana Avetikovna inhabit a sinking house in Yakutsk, Siberia, Russia. 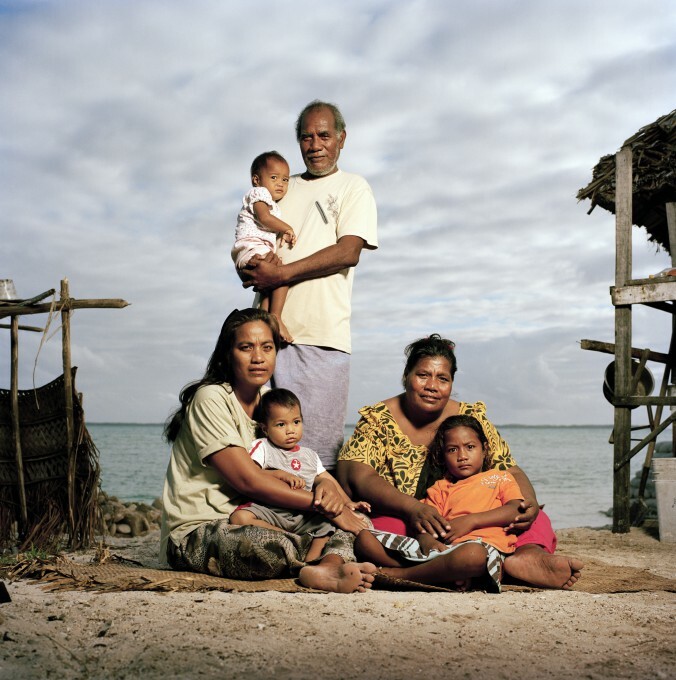 Karotu Tekita, standing, with grand daughter Akatitia (11months) and Retio Tataua (left) with son Tioti and Tokanikai Karolu with grand daughter Bwetaa are living in a village in Tobikeinano, South Tarawa, Kiribati, that is sinking as the water levels rise. “One thing that struck us is that we had people in front of our camera who could not read and write, yet they knew something was happening,” says Fischer, who functions as the project manager and artistic director, drawing on her background as a dramaturge. 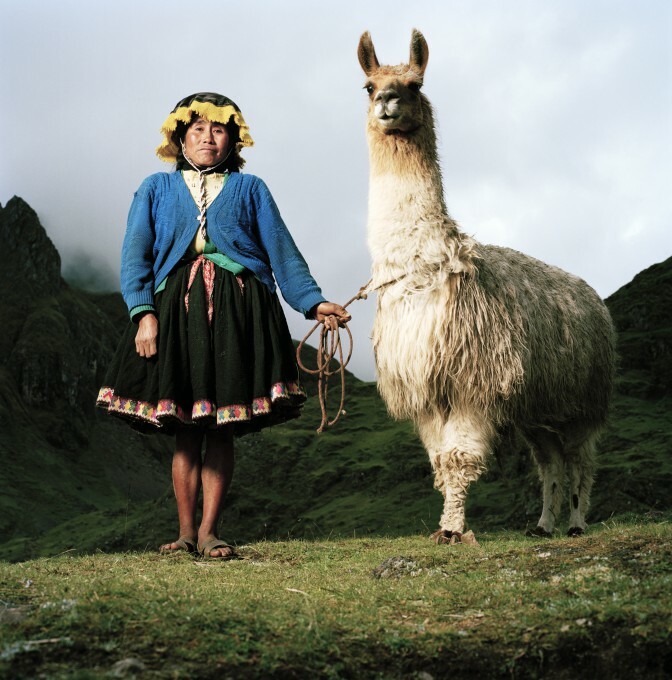 "In Peru, we photographed a woman with her llama. She said ‘I cannot read or write. I don’t know what you mean when you talk about climate change, but I know there are things changing in these mountains.’ "
Juliana Pacco Pacco, a llama herder in Paru Paru, Peru, knows that her mountains are changing, even though she doesn’t know what “climate change” means. However, even as the people impacted knew something was happening, the local officials still often denied it. "Our first destination was Australia during the worst heat wave. 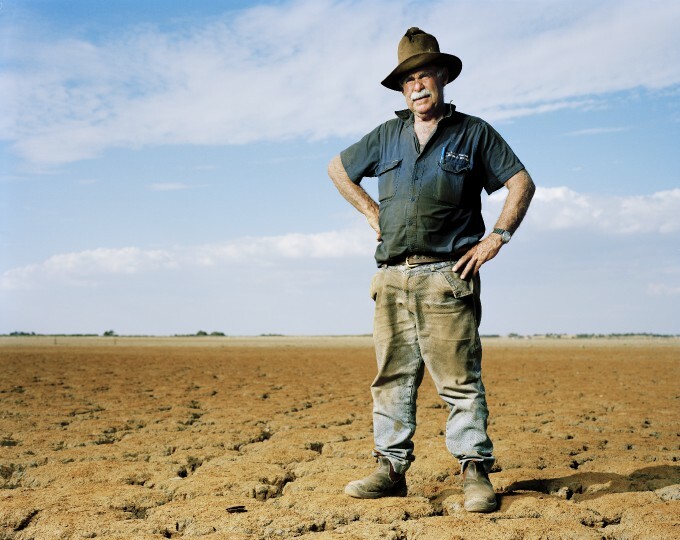 We finally met the mayor on the hottest day in the history of modern Australia and when we explained our project, he told us, ‘You know climate change is not happening.’ "
Michael John Fisher, a former dairy farmer in Merbein, South Australia, stands on land desiccated by the worst drought in modern Australian history. The team’s general strategy was to locate in advance a local person who would make a compelling story, and then when on location, find the scene that would best tell that story. They used all the standard journalistic methods: new stories, magazine articles, working through NGOs, and just old-fashioned legwork. For example, in Newtok, Alaska, the permafrost is melting and eroding the village, which lies on land between two rivers. Facing the inevitable, the Yup’ik people decided to relocate the entire village. Braschler and Fischer found and photographed school superintendent Grant Kashatok standing in his rubber books in puddles of melting permafrost. They chose one Profoto Pro Flash Head with a Profoto 7b battery operated pack, and a 60 × 80cm soft box. The one light source hits his face and body in a harsh light, fitting for the situation, and the ambient light preserves the reflections in the melted permafrost. Kashatok is shot from slightly below, so he towers above, looking strong and determined, reflecting his idea that neither he nor his people are victims. They will survive, he says, because the Yupik people have been adapting to sparse resources for thousands of years. Says Fischer, "He told us, ‘I am really worried about when climate change hits the big cities like Chicago, New York or Los Angeles. 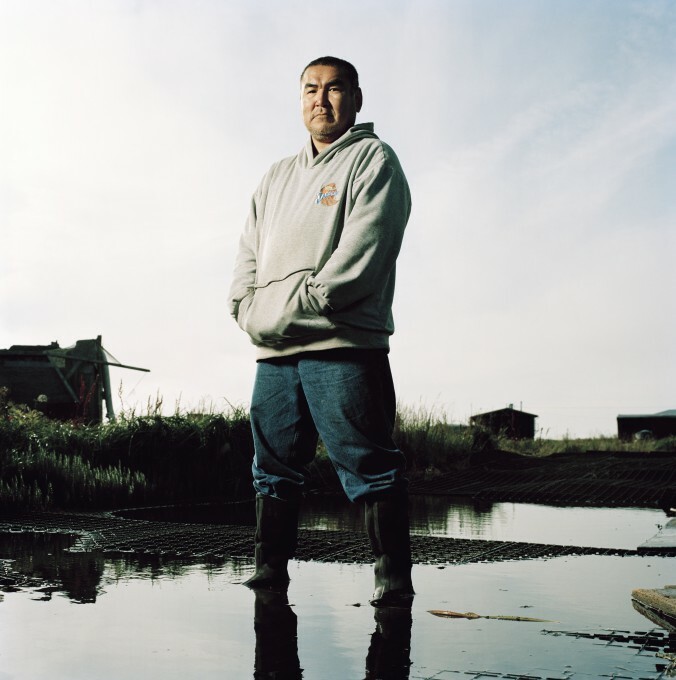 Those people don’t know how to deal with catastrophic change or how to adapt to a very different life.’ "
Grant Kashatok, Yup’ik Eskimo, School Superintendent in Newtok, Alaska, stands in puddles of melting permafrost that will be forcing his entire village to relocate more inland. project because of the harsh conditions they knew they would encounter. Mama Saranyro, a member of the nomadic Bozo tribe, struggles to make a living as a fisherman in Salamandaga, Lac KorientzéMali. The team has been producing large scale award winning projects since 2003, ranging from portraits of Americans, Chinese, the Swiss and women in Okinawa, ranked as the world’s longest living females, to more activist projects such as portraits of innocent people swept up after the American invasion of Iraq, detained in, and then released from the U.S. prison in Guantanamo. The Guantanamo project won a Professional Photographer award from the Prix Photo in 2015. Their interest in climate change continued after The Human Face of Climate Change project ended. Their new work, Act Now!, undertaken in anticipation of the recent 2015 UN Climate Change conference in Paris involved photographing celebrity climate change activists such as Richard Branson, model Gisele Bündshen, former New York mayor Michael Bloomberg, and film director James Cameron. The portraits were recently exhibited at the conference center of COP21, the United Nations climate change conference in Paris.